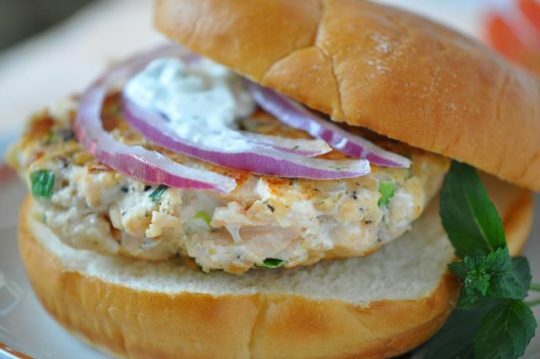 Fresh salmon makes all the difference with these sensationally delicious burgers full of snap and pop! This recipe is from Holly Clegg's trim&TERRIFIC KITCHEN 101: Secrets to Cooking Confidence: Cooking Basics Plus 150 Easy Healthy Recipes. With knife or food processor, chop salmon into small pieces. In large bowl, mix together salmon, green onions, garlic, lemon juice, dill and season to taste. In another bowl, whisk together egg and egg white and add to salmon mixture. Using your hands, gently mix salmon mixture with cereal (mixture will be loose). Form mixture into burgers. Heat large nonstick skillet coated with nonstick cooking spray over medium heat. Cook 3-4 minutes on each side or until golden brown. Terrific Tip: Salmon patties may be made ahead of time and refrigerated until ready to cook. If grilling, place salmon patties in freezer about 20-30 minutes and they will hold together better.